Batteries -- house bank consisting of six 6-volt deep cycle; two group 31engine start batteries; one group 31 thruster/windlass/davit battery. Hour-meter on starboard engine was replaced approximately 6 hours ago. The seller states that the total hours reported above are correct. Port engine turbocharger rebuilt 2014. Engine raw water pumps were replaced with an upgraded model 2016. Shaft seals and cutless bearings replaced 2019. Xantrex 2000 watt inverter/charger with LinkLITE battery monitor. Stern thruster replaced with new Side-Power SE80 2019. New macerator overboard waste pump 2019. Total LOA including dinghy suspended on davit -- 44'. Retractable radar mast to reduce airdraft. Board this 381 from either side, with molded in steps from the side deck to the cockpit. The cockpit is partially covered with a hardtop, and has a large surface area for deck chairs. A Boston Whaler is suspended on an electrically-operated davit system. Port and starboard raised sidedecks provide access to the foredeck -- on the way you'll notice that the windows all appear in excellent condition. The interior is accessed via a glass sliding door, and the salon is immediately welcoming with extremely clean and attractive carpeting, its overall excellent condition, light from large windows, and comfortable seating. A free-standing high/low fold-out table serves many functions, and the sofa is in fact a Flexsteel sleeper sofa. The U-shaped galley includes a two-burner electric cooktop, microwave, 7 cu ft Nova Kool refrigerator/freezer, and plenty of countertop surface area. Storage seems considerable, and has been further improved with added pull-out features. To starboard adjacent to the galley is the raised dinette which provides a nice view of the world outside. A U-Line icemaker is located here also. Accommodations include the master stateroom, with its island berth and the guest stateoom, with a double bed tucked partially under the dinette. Good storage and hanging locker space are provided in both staterooms. The head compartment includes an enclosed shower/tub, and is attractively designed. The flybridge is accessed by a molded stairway (beats a ladder any day! ), and is fully enclosed with a bimini and isinglass windows. A large U-shaped settee seats five, in addition to the captain's seat. The helm station provides good all-around visibility. Cabin heat is provided by a Red Dot engine bus heater, or portable electric heaters. Note that there is not an installed furnace or reverse-cycle heat/air. Installation of a preferred system would not be difficult or expensive. TVs in master stateroom and salon, both with DVD players. Remotely-controlled spotlight. Installed foredeck lights. This Meridian 381 appears in unusually nice condition and has a history of attentive maintenance and equipment upgrades/replacements. The seller has owned the boat for five years and moored it under cover and in fresh water. Every cruising season began with a thorough professional detailing and the boat shows exceptionally well -- from the gel coat to the carpets to the upholstery. A Nick Jackson 1000 lb transom-mounted davit system carries a classic Boston Whaler 11' dinghy (a popular model that is no longer available). 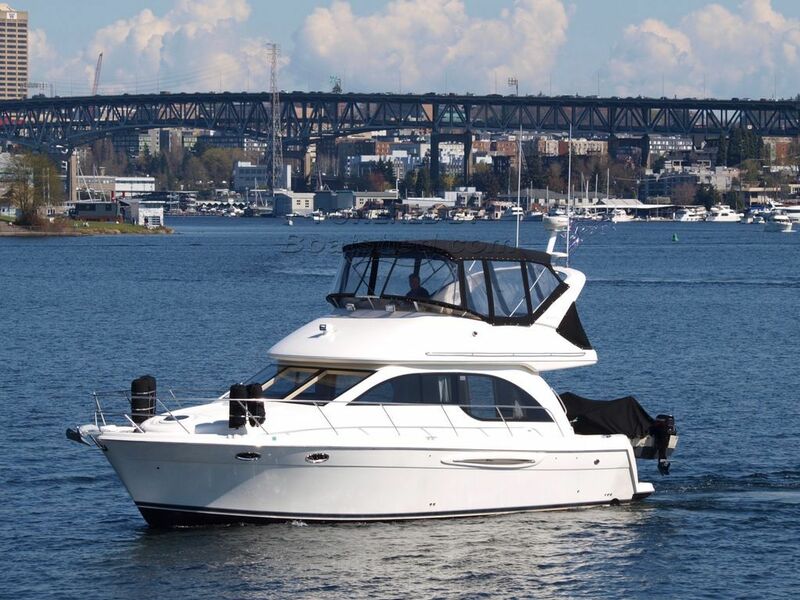 This Meridian 381 Sedan has been personally photographed and viewed by Scott Helker of Boatshed Seattle. Click here for contact details.